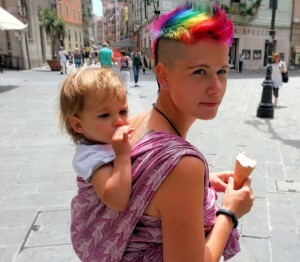 If you are reading this hoping to find the magical solution to keep cool in summer when wearing your baby, I’m sorry, I haven’t found one yet. You will get sweaty and warm, but you would have been sweaty and warm pushing a pram too. I do hope to give some helpful tips on how to keep babywearing most comfortable and safe for you and your child during warmer weather. Most carriers (full buckle, half buckle, mei tai) will be very airy, because of the open sides. There are even some carriers with a (partly) mesh bodypanel or UV(A) protection. A ringsling is a great idea too! Especially of it’s made out of a light and airy material it’s a good option. Less body contact, which makes it less sweaty. Try some linen, bamboo, cotton or silk, they can be very supportive and lightweight. 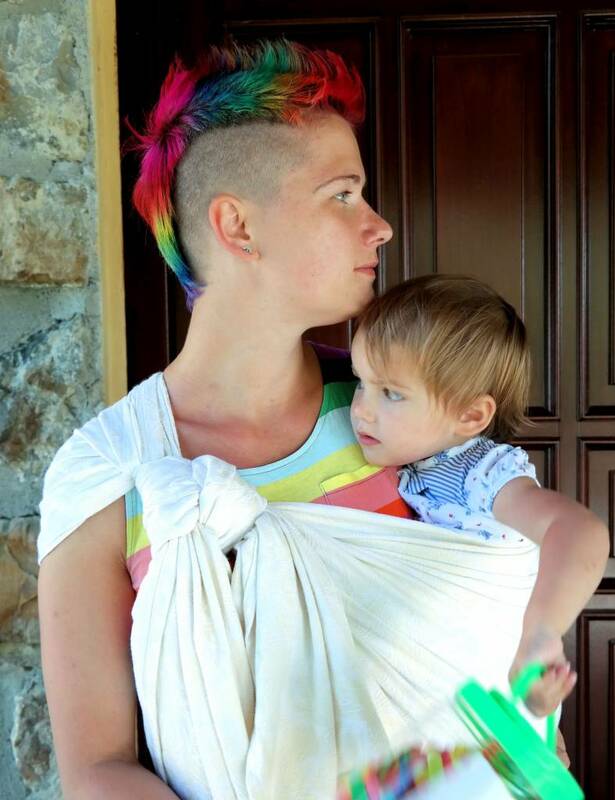 Most woven wrap brands sell pieces of their wraps converted as ringslings, but you could look at brands like Sakura bloom too. 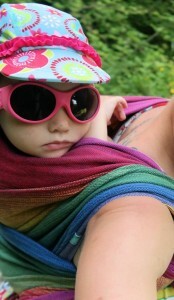 I love my linen SB ringsling! Most stretchy wraps are not very airy and because of the two or three layer carries it might not be the best choice for hotter weather. A lot of fabric, less airflow. 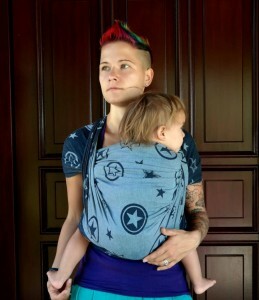 Wrapsody sells a hybrid that should be more airy compared to other stretchy wraps. Moby sells a wrap with UV protection. 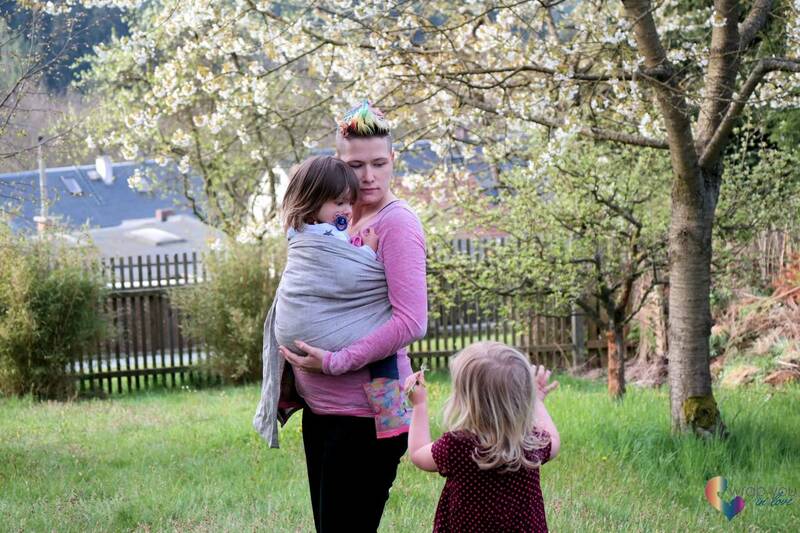 A lightweight, airy woven wrap is versatile and can be used for many carries. There are some wraps that are known to be a less dense (and more airy) weave. Some examples are Hoppediz ‘das leichte’, Vatanai, Calin Bleu and Ellaroo. Looking at blends might be a great idea, linen, hemp and silk (combined with cotton) are great in hotter weather. I love bamboo too. Not every linen or hemp wrap is airy, so it might be helpful to try before you buy. You could also look at wool blends, because of the temperature regulating qualities. I prefer easy washable blends and wraps that dry quickly, if you don’t own more wraps you would want a wrap to be ready for use in the afternoon or the next day after a sweaty hike. There are also some brands selling mesh wraps or aqua carriers. I am not familiar with them, but a great plus is that you can use them in the water too, nice idea for a beach trip! 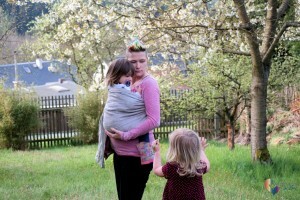 If you are wrapping a heavier child and you really need more layers, it might be a good idea to try some different carries. The double hammock covers a big part of your body with the wrap, which could make you feel warmer compared to a BWCC or christinas ruckless for example. – avoiding skin-to-skin contact. 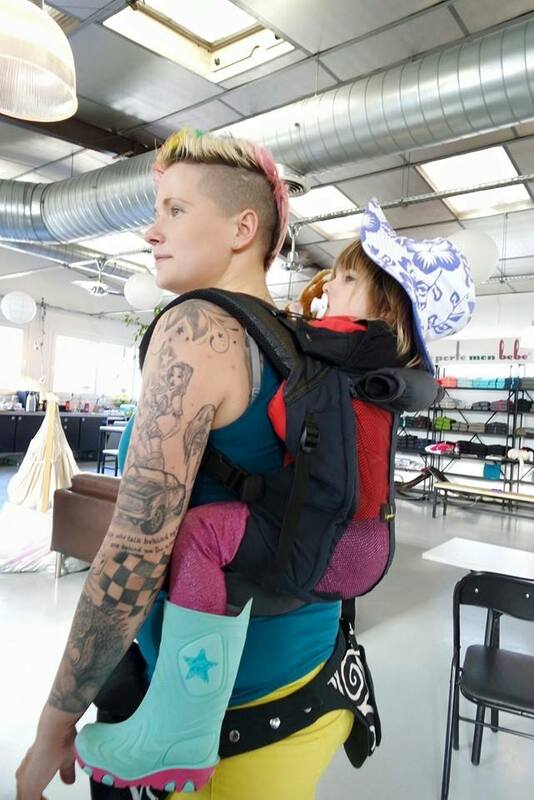 This might sound strange for a babywearing mama but in some situations it’s just more comfortable not to have direct skin contact. If you don’t have a thin layer of clothing between you and your baby, you can use a muslin to avoid sticking together with your warm sweaty bodies. – don’t forget a hat! I love sunhats that cover the back of their neck and keep the sun out of their face. Always afraid to lose the hat? If it has cords I attach them to clips ( Dapper Snapper sells these, but you can probably find them in a sewing shop too), this way you can clip it on to your clothing, wrap or your child’s clothing so you’ll never end up without the hat. If the hat doesn’t have cords you can add one. 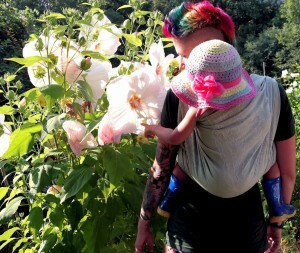 – If your baby doesn’t feel comfortable with bare legs in the wrap/carrier, you could try UV-legwarmers. Babylegs has some very cool prints. – pick natural fabrics. Linen, cotton. – already mentioned above: If you don’t have a thin layer of clothing between you and your baby, you can use a muslin to avoid sticking together with your warm sweaty bodies. There are also pieced of fabric available designed especially for this purpose. 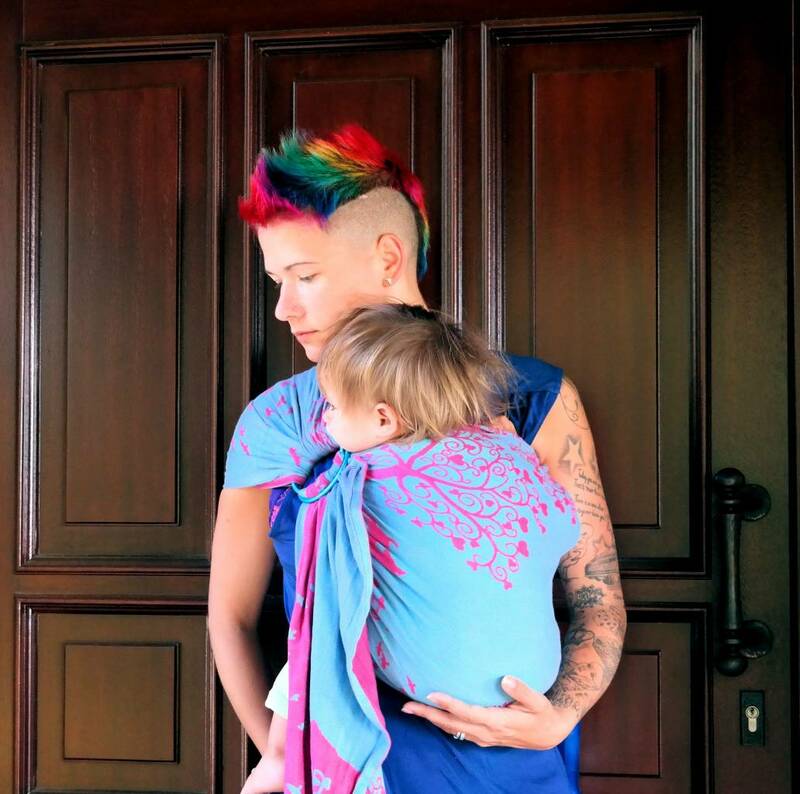 (at angel-wings) It’s a triangle you can wear either on your chest or on your back and your child’s face will rest on it. It absorves the sweat and feels cooler compared to direct skin contact. Such a great sollution! – drink! Your baby should stay hydrated (mostly theres no need to offer additional water to your bresstfeeding baby, but a formula fed baby might need extra water) and don’t forget yourself! bring a bottle of water with you! – use skin protection. 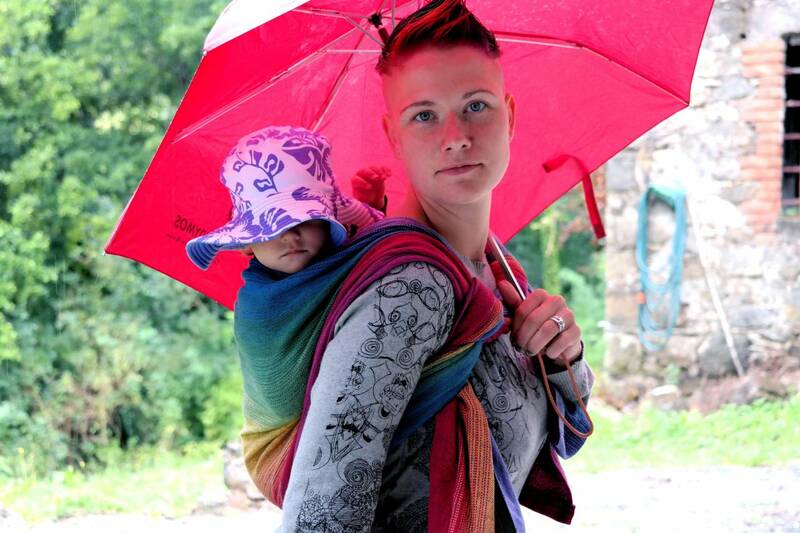 Most wraps don’t have a high SPF (some carriers do!) And the legs, arms, head and neck might be directly exposed to the sun. To protect your child you can use sunscreen, put a sunhat on (which covers the back of their neck), use UV-babylegs (they can be worn on the arms too) or use the tail of your sling or hood of the mei tai for covering (please make sure the airways are free). You can use a sun blanket, I wouldn’t recommend to use this to keep their face out of the sun, but for the arms/legs it’s a great option. – check on your baby. Overheating can be dangerous! – try to travel light. Bringing a huge/heavy bag or backpack with you makes you even warmer. ”Dip babylegs in lukewarm water before putting them on if it is REALLY hot. But then check babys temperature often, so she does not get too cold. Here’s a facebook post with summer wrap suggestions.